I present to you a completely fictional RFC skin for Sikorsky S-16, inspired by Bristol Scout. In-game S-16 is an excellent counterpart to Fokker E.III and I hope skins like this one will encourage using S-16 in "early" Western Front multiplayer maps, pretending to be British plane not unlike S-16 or Bristol were. On the Bristol vs S-16 comparison: the two planes look nothing alike, but they share more characteristics than I expected, including most dimentions, engine and, apparently, ease of handling. They differ in mass, speed and armament; Bristol was lighter, faster and better climber, but came unarmed; S-16 was heavier, slower, but came weighted down with Maxim MG, synchroniser mechanism and ammunition as standard. It's unlikely we will see a proper Bristol in RoF, the S-16 is asking to find more uses for it and Bristol with synchronised gun would lose some of its trademark performance, why not have fun with "British" plane of similar performance? So, here comes a fictional scout that's definetly not a Bristol, but is really tries to hit same aesthetics and fill the same niche. The pack includes two canvas coloured skins, lighter clean one and greenish dark one. They are hard to tell apart in screenshots but differ when viewed side-by-side. The S-16 engine skin bug is, unfortunately, still active. I am not sure if I should vote since I never fly mods-off, but I like your treatment of the skin. Looks like a freshly pressed linen suit, just right for lunch at the polo club. (The pilot needs one too). Perhaps a serial number on the tail for some fake authenticity? Like the idea, so I voted YES! Maybe I'll put this idea into consideration for this years "Eagle of Lille". I know some guys did change the W12 to a W29 the EIII which was changed to a Bleriot, a Pfalz Etype and even a Morane. The Re8 to a Be2 etc. Think the title whould be better a British S16 fictional and forget the Bristol. It's Briton, not Bristol , I couldn't resist the pun. In game it was called either "Fictional British skin inspired by Brostol Scout" or "Fictional British plane" (google translate can only get you so far). You are right, though. I changed in-game descriptions to "Fictional British S-16" and updated the archive. Thanks! At one point in my WWI simulator career I had First Eagles (ThirdWire 2006), OFF2 then OFF3, HitR, then RoF ICE installed. My mere mention that 777 had released a RoF campaign 'career mode' over at the OFF forum got me banned there. Maybe things have changed and they tolerate discussion of RoF on Woff forum, but I doubt it. So for me at least, that is enough with your Woff comments, jibes, and overt recruitment. Woff has its own forum, keep Woff 'spam' there or at least to the Woff forum topic (generously provided) and out of RoF threads. As I say over and over, if you love WWI sims then there should be room on your HDD for both. Also, could alpha channel edit be used to reduce the 4 tires on the S16 to 2 tires??? Alpha channel edit could also be used to round the trailing edge of the rudder to look more like the Tabloid. BTW, not all Tabloids had the forward 'skis' on the landing gear. 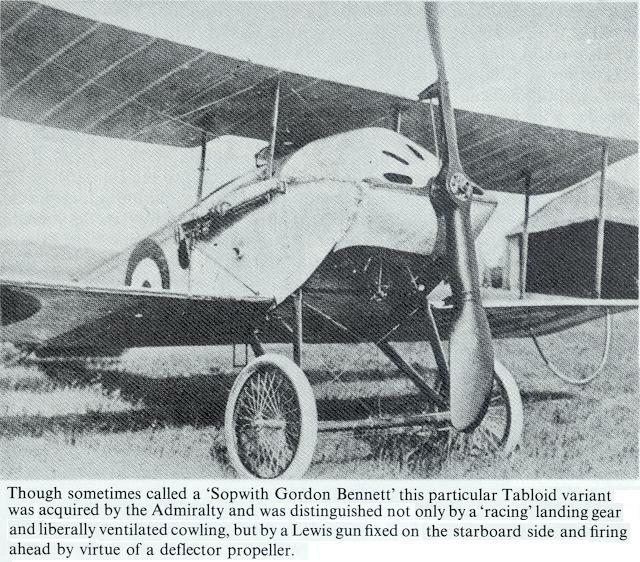 Some Tabloids had forward firing Lewis armament (both overwing and deflector, see below), so again, having the S16 maxim is at least more in line. Just a suggestion. I'm a great fan of WW1 flysims and I do have more than 10 WW1 flysims, even the Sikorsky game, I think every good WW1 game needs attention, only right now the left overs, [in a very small market] are only RoF and WoFF. Bandy, I had the same on Combat ace forum, even de OBD team members were bashing at me about RoF. As a result I did refuse to buy Hitr and deleted OFF3. I was one of the guys who did buy OFF3 DVD the same day as it was released and btw RoF was the first game ever I did buy in preorder. Believe me things have been positive changed on the Simhq forum, only criticism on WoFF, oeps, that is still a weak spot for those guys. My remarks about lack of Force Feedback in WoFF, did resulted in lots of bad pm and neglection, but I refuse to keep this still. I can tell you if new serious developments are going to happen about RoF [not the sales] I'm also publish this on the WoFF forum, like I do this here for WoFF, when members are asking for planes that are in available in WoFF, as a sample. After RoF/WoFF I think, no WW1 flysims will be on the market, only arcade or bad made garbage, so both games needs the publicity to keep WW1 still in the picture. Sorry I'm not going to stop.